Why do these keep popping up? Every now and then, I'd see this little rock pop up in a deck photo. I didn't think much of it at first, but then my curiosity got the better of me. Why were they in there? Why would someone who is running all the Moxes, dual lands and City of Brass they need still run a Fellwar Stone or better yet, multiple copies of it? It's not like they were short on land or other fast mana sources. It just didn't make sense. It was however, a deliberate choice and that's what caught my attention. They were being played not by choice, not accident or necessity. And it wasn't just the losing decks that were doing this. Old School Mtg has a great post covering 49 decks to beat from recent tournaments and more importantly, deck photos for most of the decks. A wealth of information hides in those photos if you know what you're looking for. I decided to go through all of the those decks and see just how many were running Fellwar Stones. Is there something to this "stone" thing or am I just losing my mind in my old age? Both equally viable possibilities. I hoped for the former and prepared for the latter. I decided not to limit my investigation and I went through every deck picture. Besides I like looking at what others are playing. Image credit: Incredibly scientific chart by me. Out of the 47 decks I went through, 22 had at least one Fellwar Stone. Of those 22 decks that had stones, 20 of them had more than one copy (the most common being two). That's nearly 50 percent of the decks I found that run Fellwar Stones. Now that I'm not losing my mind, it was time to dig a bit deeper and do some experimenting. I'd immediately put two of them in my deck in place of a pair of dual lands. I figured I needed to find out a few things for myself. 1. Why are they being included? 3. Do they really work? I was skeptical doing this at first. Trading out a pair of dual lands for a pair of artifacts that cost two mana to get into play and only have a return of one mana (and that's only one of the colors your opponent has in play) didn't seem like the brightest plan. In all honesty though, I've done dumber things. I'm glad I did this little experiment. In part to push my boundaries and look at/try out cards I don't normally play with and in part to expand my understanding of game strategies. Let's look at what I learned in my little experiment. Speed. I know, there are faster ways, but there's only so many moxes you can play. 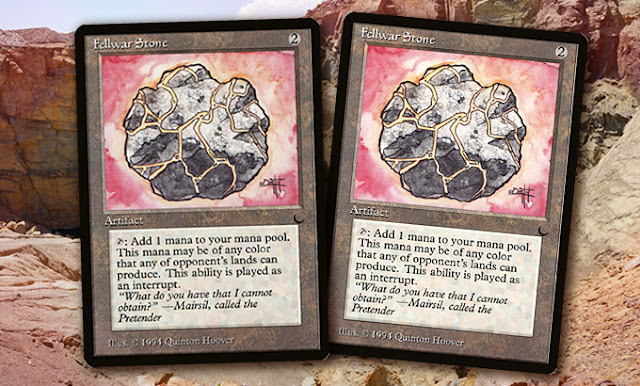 Stones, while they cost two to get into play, are another way to speed up your mana base in the early stages of the game. The more ways you have to speed up the amount of mana you can get into play, the sooner you can both react to threats and get your own into play (especially your big ones!). That's what they did for me. Drawing a stone in my initial hand with just one mox was great because I could play the land and the mox to drop the stone on my first turn. Play another land on my second turn and all of a sudden I have four mana on my second turn to work with. I believe they are. I thought of the stones as being able to give me "colorless" mana. 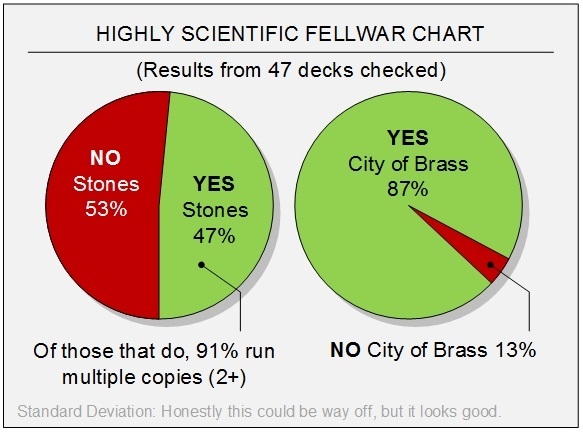 They're technically limited to providing the color mana your opponent has in play, but that's not always a bad thing as most Old School players run City of Brass in their decks (see chart above: of the 47 decks I looked at, only 6 did not). If you run a 3 or 4 color deck, chances are your stones will provide you with a color you need. If you're running a mono-color or just splash a second color in your deck, then you'll most likely be using them for "colorless" mana. They also help broaden your mana base against land hate like Armageddon, Strip Mines and Sinkholes but unfortunately not against things like Blood Moon. They also fall prey to Energy Flux like the rest of your artifacts will do. Even if your opponent is running a color you don't use in your deck, the stones aren't completely worthless in that they'll still provide mana. Yes. On more than one occasion I was glad I had a stone in play as it gave me one more "colorless" mana early on and in some cases, the exact color I needed compliments of my opponent when I hadn't pulled that color from my own deck yet. Ultimately, what's the verdict here? Do they speed up your deck so much that you can't live without them? Probably not. The decks that seem to do the best are those multi-color (3 or more) decks that favor the higher costing spells. The stones add speed and you'll most likely be able to use the color generated as opposed to having to tap it for "colorless." I'm keeping them in my deck for a bit longer to get a better feel for their impact. I'm in no rush to pull them since I've already had success with them. I may in the future look at swapping them out for Mana Vaults, but that's another experiment for another time. NOTE: I'm fully aware Fellwar Stones do not tap to provide "colorless" mana. It needs to be a color that your opponent's land produce. The term was used throughout this post to signify tapping the stone for mana where the color did not matter. You just needed it to fill out the remaining mana cost for a spell you wanted to cast.